Well, it's another gloomy day in Tokyo. It would be a perfect day for crafts if I wasn't out one bouncy chair today. Without the bouncy chair, nothing is easy. 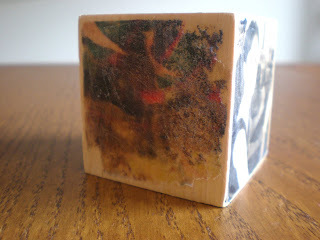 But still, I managed to get a few of these picture blocks done. I think they'd look good on my office desk or stacked on the coffee table in place of the usual photo albums. 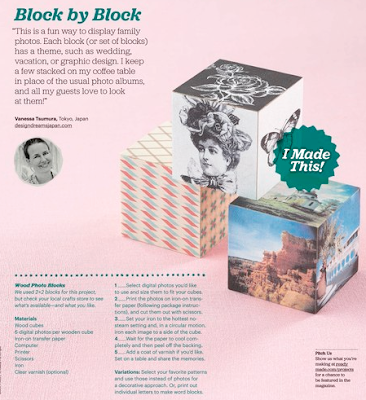 Each block (or set of blocks) has a different theme -- wedding, honeymoon, baby's first year, etc. Now isn't that a fun way to look back on some of life's adventures? These, by the way, aren't toys. I have no idea what happens when these things are popped into little mouths and I'm not going to find out. A coat of Mod Podge might make it safe, but I'm not sure, so best just to keep them out of reach from little hands. Sorry to be all gloom and doom, but I have another warning. This project involves a hot iron (read: NOT A KID CRAFT). And adults need to proceed with caution. Don't go leaving your hot iron face down on a wooden block while you run to answer your cell phone, OK? OK. Here's how I did it. I used that transfer paper I had left over from the Zoo Pillow project and some wood blocks from my local craft store. So technically this isn't a 100 yen store idea. 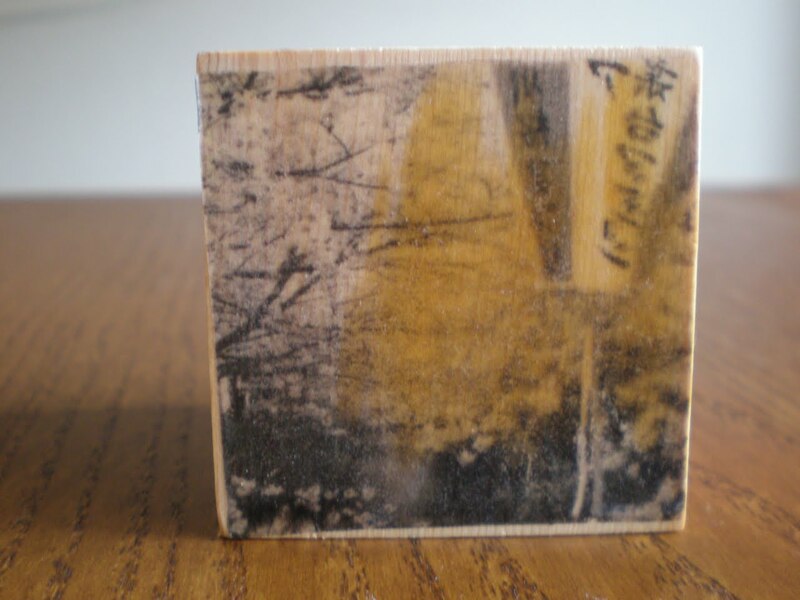 But the blocks were actually under 100 yen each (or less than $1), so it's definitely a thrifty gal's project. 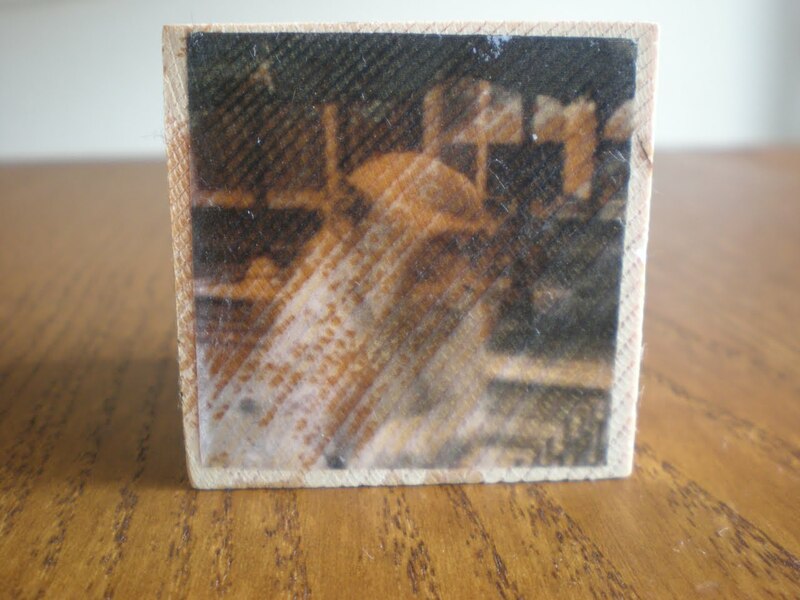 First, I chose my pictures and sized them on my computer to fit my blocks. Then I printed them out on a sheet of iron-on transfer paper (fit as many pictures as you can on one sheet). After cutting them out, I ironed them onto the blocks using the hottest no-steam setting. You can go back here for more tips and how-to's for iron transfer paper. Note: Ironing onto wood takes a little less time than it does for fabric. The wood grain really shows through here. Cut each picture just a tad smaller than the size of the cube. Use sand paper to smooth out any rough spots. The look is "antiqued" not "perfection." The wood grain shows through on lighter pictures, so use more saturated color photos or dark black and whites if you don't want to see a lot of wood coming through. Iron slowly (in a circular motion) or the image might slip and look blurry. Keep your fingers as far away as possible from the iron! the picture slipped, making it look blurry. This project got published in a magazine! The Dec/Jan issue of ReadyMade. 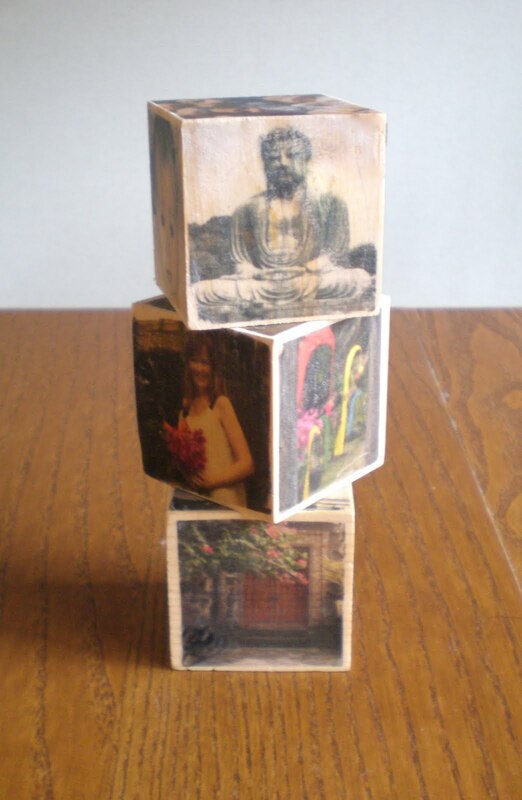 Nice work - we sell wooden cubes in several different sizes - check out our website at www.caseyswood.com - and select the link on the left under categories for Cubes & Blocks.